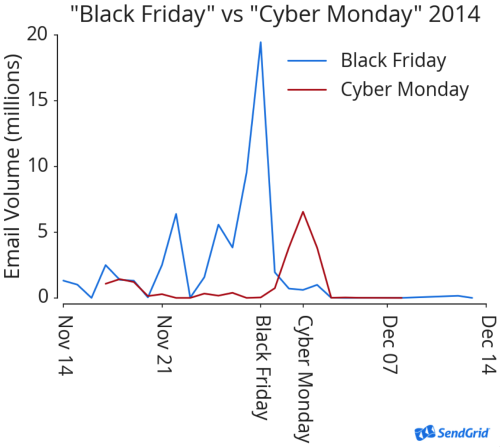 Black Friday and Cyber Monday are terms nearly everyone is familiar with. The two shopping events kick off the holiday shopping season ahead of Christmas with thousands of stores and online retailers offering limited sales and deeply discounted items. Americans alone are expected to spend $5.7 billion on the two largest sales days of the year. This year, we worked with SendGrid’s Victor Amin, Data Scientist, to look at data from 2014 to see if there’s anything that may be helpful to senders this year. We’ve also provided some tips for senders that are planning on messaging their customers or users around that weekend. 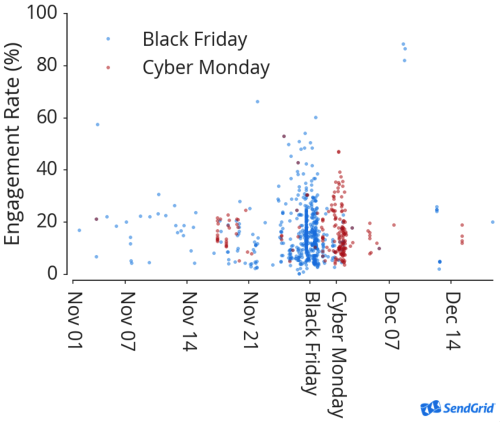 To focus this study on Black Friday and Cyber Monday, we concentrated on marketing emails. 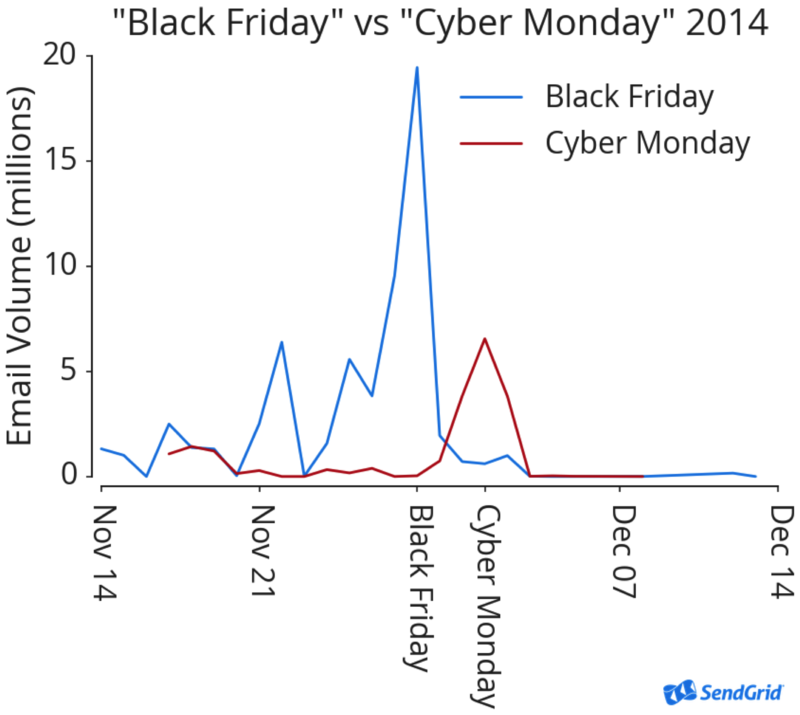 Specifically, we looked at email subject lines to determine if an email was related to a specific holiday (for example, if the subject included the phrase “black friday,” it counted toward Black Friday statistics). In order to look at engagement, we defined an engagement as a unique open or click within an email. 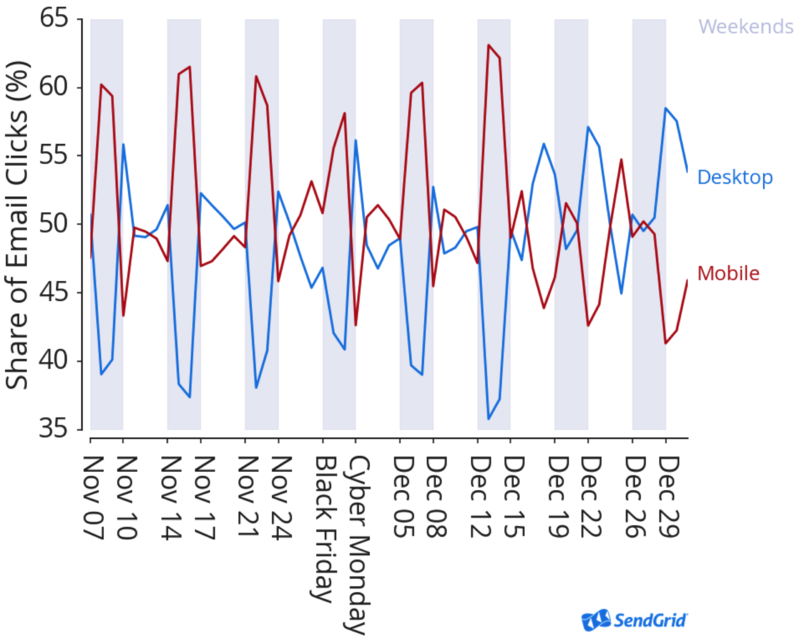 From our data, it looks like emails sent with the phrases “black friday” or “cyber monday” peak on those specific days rather than prior to those days. 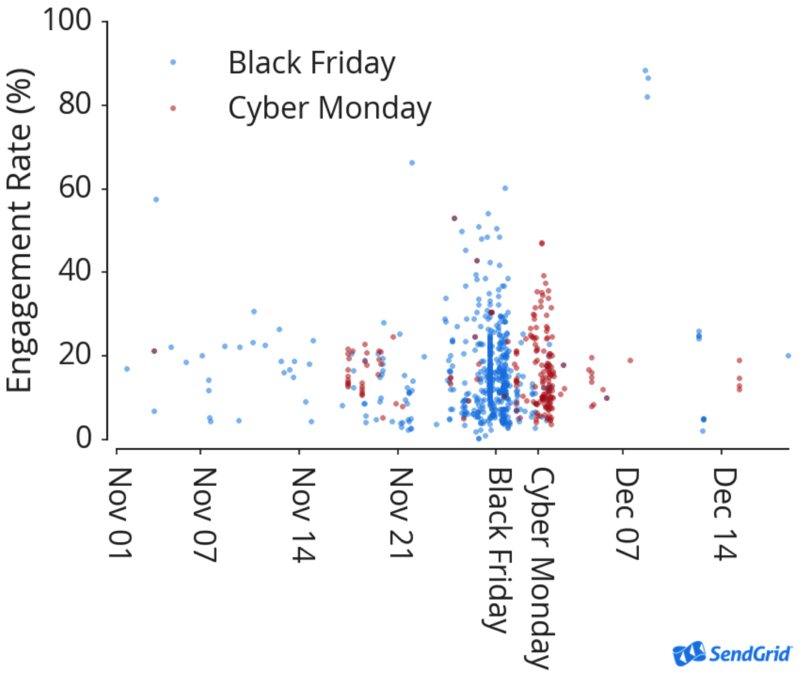 Some people can get distracted by this plot, thinking engagement rates are higher on Black Friday than on Cyber Monday, but the fact is, there’s just more volume, which means there’s more noise and some outliers stand out. We also found that Black Friday engagement is a bit lower than overall newsletter engagement during the same period. 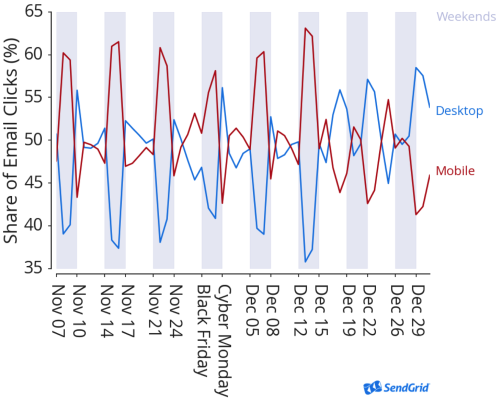 During the holiday season, newsletters got an average engagement rate of 22.1%, Black Friday newsletters got an average engagement rate of 15.5%, and Cyber Monday newsletters got an average engagement rate of 16.2%. Recipient list size – As the number of recipients grows, engagement rates go down. According to our data on list sizes, every 1,000 extra recipients correlates with a 0.016% decrease in engagement rate on average. We think this trend is related to recipient targeting and list cleanliness. Smaller lists tend to be more targeted, and pruned of non-engagers, resulting in higher engagement rates. In other words, simply having a smaller list won’t help–it has to be smaller and cleaner. Sending frequency – As the number of sends increases, engagement rates go down. According to our modeling, every extra send correlates with a 0.06% decrease in engagement rate. Therefore a sender who sent 100 Black Friday emails would be expected to have an 11% engagement rate, compared to 16.5% for a sender who sent only 10 Black Friday emails. This downward trend in engagement is known as email fatigue. Every person has a different tolerance for email volume, and when that tolerance is exceeded, they’re less likely to engage, and are more likely to unsubscribe entirely or mark messages as spam. 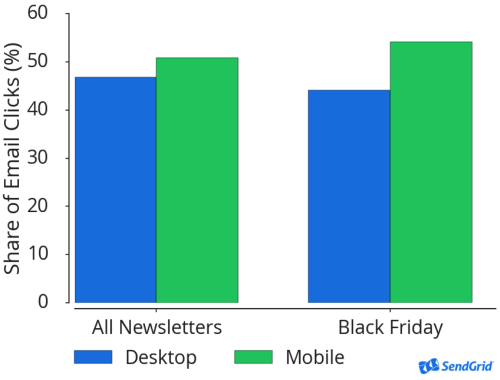 We’ve known for a while now that mobile usage peaks during the weekend when people are away from their desks, and we wanted to see if mobile usage might peak on shopping days like Black Friday, as shoppers checked for deals on the go. 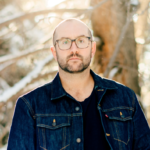 Be wary of sending multiple emails per day – Oftentimes email fatigue results in more than unengaged recipients. Fatigued and annoyed users block, unsubscribe, and send messages to spam. Keep your recipient list as clean as possible – Well-maintained lists consistently have higher engagement rates than older, neglected lists. Make sure you’re removing addresses that haven’t engaged in a long time and segment your list by engagement. Building a negative reputation with ISPs can have a major impact on revenue, especially around the holidays. Consider the timing of your sends – If you think your recipients are being inundated with Black Friday or Cyber Monday emails the day of, get creative and find other ways to stand out in the inbox by testing new subject lines or personalizing messages in new ways. Utilize responsive design – Since recipients tend to look at email on their phones even more on weekends, it’s important to make sure messages are designed to be mobile-friendly. Visit our email marketing page to see how you can take advantage of SendGrid’s email delivery platform to send your marketing emails for any time of year and for more email data insights from Victor, check out some of his other studies on the blog.